(GWINNETT-METRO ATLANTA) April 11, 2019 – Partnership Gwinnett joined Elemaster U.S., a global mechatronics services provider, today to celebrate the grand opening of a new high-tech electronic equipment design and manufacturing facility in Duluth, Gwinnett County, Georgia. The new facility, located at 3400 Rivergreen Court in the City of Duluth, is dedicated to the manufacturing of printed circuit board assemblies and turn-key products destined for rail, transit, medical, and industrial sectors. The new location currently houses 40 staff members with a planned growth of an additional 20 jobs in 2019 and up to 50 additional jobs by 2020. The site represents a $3M investment that includes manufacturing equipment and advanced multimedia conference rooms used for worldwide customer communications. 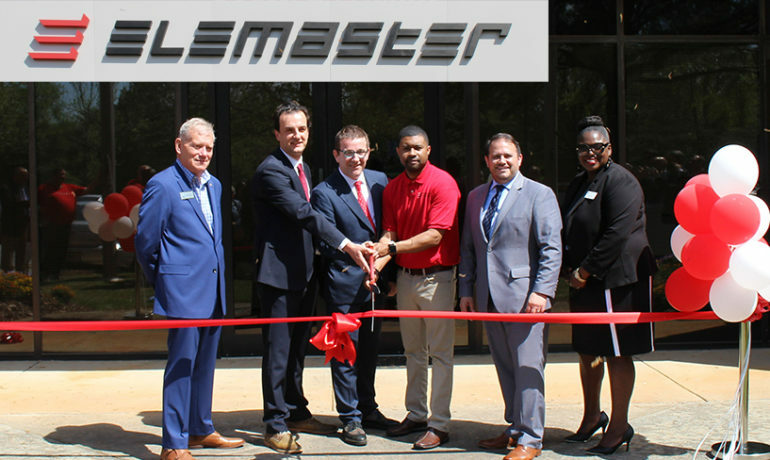 The new Elemaster U.S. facility will allow the company to support important new market opportunities and provide local original design and electronic manufacturing services to better serve their current customers. In operation since 1978, Elemaster is a one-stop-shop and global player in the high-tech sector including rail, medical, automotive, avionics, industrial, and energy sector solutions. It is headquartered in Milan, Italy with global locations in Germany, Belgium, France, Romania, Tunisia, China, and India. Elemaster is certified ISO 14001 and was awarded Deloitte’s Best Managed Companies in 2018. Senior Director of Economic Development, Andrew Carnes, represented Partnership Gwinnett in conjunction with the Georgia Department of Economic Development, Georgia EMC, Georgia Power and Rodl & Partners on the project expansion. “Elemaster is a worldwide leader in advanced manufacturing, one of our target industries for the county. We’re very pleased to have them here and look forward to their continued success in Gwinnett,” said Andrew Carnes, Senior Director of Economic Development for Partnership Gwinnett. Founded in 1978, Elemaster stands out in the competitive scenario as Mechatronics Service Provider, offering to its own Clients services of design and manufacture of high-tech electronic equipment. Today Elemaster stands on the market as a One Stop Shop for its Customers who are the major global players in the high-tech sectors such as railways, avionics, medical, automotive, industrial and energy sectors. To learn more about Elemaster, please visit www.elemaster.com.